Summary: A young girl purchases a bear from a department store, despite his missing button. I brought in a small teddy bear and a small flashlight. While the children covered their eyes, I hid Corduroy. I chose one child to be the nightguard. He used the flashlight to find Corduroy while the other children cheered him on. We then took turns with all the children hiding and finding Corduroy. The game was a HUGE hit, we probably could have played the entire 55 minute class. I printed and laminated 4×6 pictures of a house, apartment, houseboat, space station, igloo, teepee. We named each and talked about who might live there and why. We discussed which one would be the most fun to live in, and why some might not be so fun. I brought in a clean metal can with a plastic lid and a dozen pennies. I had cut a small rectangle in the top of the lid so that the pennies were easily dropped in. The children were all excited to hear the ‘clink’ of the coins hitting the bottom, many counted with me as they dropped the pennies in. Be careful, this could be a choking hazard with very young toddlers. 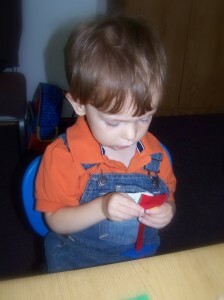 We let the children experiment with some cloth “busy books” that had zippers, snaps, velcro, etc. and talked about the different ways clothing fastens. This is also when I introduced the button snakes. This entry was posted in Picture Books, What We're Doing, What We're Reading and tagged BFIAR, book, co-op, Toddler. Bookmark the permalink.